It is with great pride an excitement that we share with our members the news that An Taoiseach Enda Kenny will attend an opening ceremony for our new gym and changing room facilities. Mr Kenny will officially cut the ribbon on April 25th @5pm. This is in reflection of Scoil Uí Chonaill's ongoing contribution to the the efforts being made to focus on the development and support of the North East Inner City. There will be a number of dignitaries in attendance and all members are encouraged to attend, ideally sporting Scoil gear and/or colours. Please note that due to logistical measures parking will be at an absolute minimum and members should consider walking/cycling, public transport or at the very least car pooling to avoid any congestion. There will be tea, coffee and refreshments in the Clubhouse and an exhibition game between two of the Deis schools with which we are associated. Additional details will follow in next week's newsletter. An event like this is very special indeed, and any members who wish to contribute in any way to its smooth running please get in touch. In preparations for the visit of An Taoiseach there will be a Club clean-up on Good Friday (April 14th) from 10.30am. All members are encouraged to lend a hand for whatever length of time you can spare. 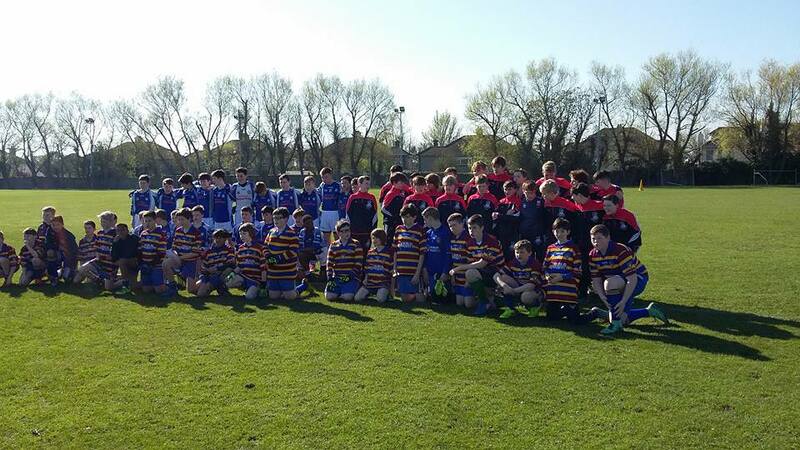 Scoil Uí Chonaill hosted the boys Division 9 football Féile last Saturday in beautiful weather. The sun was out, the sandwiches were made and tea and cakes were at the ready. Just 3 teams were in competition - Scoil Uí Chonaill, Skerries Harps and St Brigid's Castleknock. First up was Scoil Uí Chonaill and Skerries. This was a fast paced, exciting game, with Skerries the winners. Next up, was Skerries and St Brigid's. This game was not as close as Brigid's went ahead at the start. Despite Skerries coming back strong in the second half, St Brigid's were victorious. The final match of the day was Scoil Uí Chonaill vs St Brigid's. Spectators were nervous after witnessing the last game but Scoil got off to a roaring start with a quick goal and a point. However Brigid's recovered and claimed the title as the stronger team and overall winners. All in all, it was a great day and a great experience for the U13 team who will get compete in Féile again next year. Thank you to all who helped and supported our team, especially our trainers: Cathal, Colm and Paul. Team list: Cathal O'Connell, Liam Carty, Seán O'Flaherty, Dan MacCathumhaoil, Donal Phelan, Thomas Phelan, Ethan Cassidy, Caleb McDermott, Zach McKeown, Conleth Thorne, Borna Kori, Nikhil Rai Gobind, Sufyaan Moussa, Rian Farrell, Max Cunningham, Graham Burnett-Keoghan, Daragh Maher, Paul Barlau, Blaine Darcy, Cian Whelan, Stephen O'Brien, Justin Anene, Tunde Williams, Jake Byrne, Brendan O'Connell. BOOK YOUR EASTER CAMP PLACE NOW! The Founding Mother of Scoil Ladies Football and now the Mother to many grateful male footballers come Thursday evening soup & sambo hour...meet Maura O'Connell! How long have you been involved in Scoil Ui Chonaill? None. By my first name is fine! Beaumont, Dublin originally. Then I got married and moved to Chapelizod. I'm back living in Beaumont 6 years now. Went to school in Maryfield and played camogie in school. My Twin Sister Aine joined Scoil and then I joined a couple of weeks later and never looked back! Played intermediate camogie with Scoil back in the day when our games were in the Phoenix Park. That's when cattle grazed there and you had to chase them off the pitch before the match started! Also there were no dressing rooms but we had so much fun! That's how I met Mossey. I started Girls football along with the help of Mossey and numerous other people involved in the Club. I also ran the under 10 /12 girls team and both Mossey and myself started the summer camps in the Club. I'd say starting the girls football in the Club & being married to Mossey. Oh, and being a clean freak! Seeing how the ladies section has gotten bigger and improved. Also seeing my two sons play for the Club and how committed the adult section are and the hard work the coaches have put into the team. I'd like to knock it down and start again with a bigger kitchen and shop in the club house, with a raised viewing area to watch the games and a score board. Ever thought of a snazzy tagline that could sum Scoil up? Always bidding to sell ourselves in different ways, we would like to establish a simple, short one liner which sums up Scoil and who we are. The ahl3 team played the third league game against Sylvester's in Clontarf on Saturday. The team started brightly and a good spread of scorers had us leading by 1:7 to 0:3 at halftime. The goal scorer was Padraig Morrissey, his first score for Scoil. We started the second half well and a good point for Scoil was incorrectly ruled wide by the referee. This invigorated Sylvester's and they dominated for the next 20 minutes and drew level with 10 minutes to go. Sylvester's were through on goal again but Danny pulled off a terrific save to keep us in the game. Scoil rallied and a superb point by Eoin Kennedy was the turning point and we were 3 points ahead in injury time, when Sylvester's hit a consolation point. A late substitute was Robert Kennedy who was makings his Inter debut and he topped it off with a great point from close to the touchline. We sit in third place, level on points with Ballyboden & Round Towers. Only 8 more wins needed to guarantee automatic promotion to division 2. Great weekend for the Scoil Hurling faternity. To follow up on the 3 point win over Slyvesters by the AHL3 Team on Saturday evening, the AHL9 Team produced a great team performance on Sunday afternoon to take the honours v Whitehall. The AHL9 team saw some vintage display's by Richie Flavin, Shane Cotter, Darren Benham and scoring contributions from Chubbs, Podge Kelly, Ru Egan, Mike McC. D, McGrath, Aaron Kavanagh, D, Reddy and Shaun Dolan's performances added to what was great weekend for Adult Hurling at Scoil. Another comprehensive win for the adult ladies in Balheary, Swords, in the first league game of the season. The scoreline does not give a true reflection of the game as Scoil only led by 5 points going into the half time break, 5-4 to 2-8. However a blistering start to the second half saw Scoil hit 6 unanswered points in as many minutes to put us well on top. There was great interplay and unselfishness in the forward line, and for the second consecutive week, all 6 forwards found their names on the score sheet. Sinead De Burca came away with a powerful 2-8, and was aided in the full forward line by Hannah Leahy and Emma Condon both bagging 2-2. Fine defensive displays in the second half from Nicole Rock and Molly Power, saw us concede just 1-1, with many of Fingallians late attacks succumbing to tireless defensive pressure. Strong contributions from second half substitutes the Ni Bhroin sisters, Naoise and Caelinn, helped Scoil pull away in the final moments of the game. Next up is Parnells at home next Wednesday in the league 7pm. This was a ding-dong battle on pitch 13 in St. Anne's with Scoil suffering a one score defeat. While we were missing a few regulars and it was a very good attacking performance we still conceded a score too many. Scoil with Hannah Leahy in flying form were down by a point at half time 2:6 to 2:5 but a storming start to the 3rd quarter put Scoil on top. Lucan hit back with three quick goals and despite a great penalty scored by Hannah Costello we just could not make up the difference. It was great to have Sheena Devine in action for the 1st time this season. There was great effort and commitment from all the girls and with a little tightening up in defence they will soon return to winning ways. Scoil minors travelled to the Bogeys to play Finbarrs in an MFL3 top of the table clash last Sunday. Strong opening half from Scoil against the wind. Eoghan McKay was strong in the middle of the field. Sam Callan won a lot of ball in defence. A lot of quality possession football led to some excellent scores. Robert Kennedy was also strong in mid field running at the opposition defence. Conor Rimmer, at full forward, was well marshalled by the Finbarr's full back, Pierce O'Brien. Most of the scores came from around 30m out or more as Finbarrs defended strongly. Lots of good inter passing of the ball by Scoil. At half time, Scoil were 8 points to 2 up and it looked like we were going to win reasonably comfortably with the wind at our backs for the second half. But Finbarrs thought differently and upped their level of intensity. Ten minutes into the second half, they had scored a point and a goal followed by another point. Half way through second half they got another goal and with 5 minutes to go they got a third goal to put them 3 ahead. Scoil had managed only 2 points in the second half. At the death we won a free 30m out and the call went out, should we go for goal? The referee advised there were 2 minutes left. Scoil remained composed and Robert Kennedy popped over the free. Finbarrs won the kick out and worked the ball up the pitch. David Kennedy intercepted the ball in the middle of the field and let the ball in to Evan Caulfield. Evan carried the ball deep into the Finbarr's defence and played off a lovely ball to Conor Ennis who slotted it into the bottom right-hand corner of the net. Scoil won by a point. Great start to the season. 8 points from a possible 8. Team: Dean Fitzpatrick, Matthew O'Rourke , Conor Farrelly, Conor Ennis, Connor Barnes, Evan Caulfield, Sam Callan, Robert Kennedy, Eoghan McKay, Patrick Duffy, David Kennedy, Aaron Linnane, Darragh Corcoran, Conor Rimmer, Tomás O'Connell. Subs: Rohan van der Akker for Darragh Corcoran; Ruairi Corrigan for Aaron Linnane; Scott Collopy for Tomás O'Connell; Emmet Bolton for Matthew O'Rourke. Scorers: Robert Kennedy (0-9, 5f, 1(45')), Conor Ennis (1-0), David Kennedy (0-2). Next Minor Fixture is home hurling match vs Ballyboden at 11am on Sunday 23rd April – pitch to be confirmed. Weary Scoil go down to rampant Vincents. Scoil team Thunders laid it all on the line in sunny St. Annes against a well drilled Cuala outfit. Having endured a torrid first half and conceding 5 goals Scoil did a lot of soul searching at half time. Changes were made and with a renewed focus the Thunders drove into Cuala from the start of second half. A great feature of Scoil’s play was the numerous hooks and blocks made, along with the constant pressure put on the Cuala men when they were trying to lift and gather the ball. It would be unfair to single out any players given the great collective performance. It would be fair to say however, that everyone raised their games when it counted in the second half. Scoil continued to get score after score, reeling in Cuala. In fact Scoil could have won the game late on when a couple of balls were flashed across the Cuala defence by the busy Scoil forwards. Cuala doggedly held out for a one point win but they definitely knew they had been in a match. Lots of positives to take from this one. Well done all. The team had another highly successful outing on Sunday when we travelled to a blitz involving the local team Beann Eadair and Faughs Celtic. We played three great matches winning two and narrowly pipped in the third. There was such a great turn out of players we nearly had enough for two teams. Our usual great battling qualities were in evidence but it was great to see a great improvement in skills against quality opposition. A particular thanks to those players who answered the call to play with the opposition who I think were amazed that we volunteered some of our best players. Great as always to see every player contribute but we have to mention Abbey who showed unbelievable composure to score the winning goal with the last puck of the game in the final match. Due to the Féile festival of football, we decamped to Pitch 22, St Anne’s for our home match against Fingallians on Saturday. Unfortunately, a bumpy pitch and long grass militated against our brand of fast hurling by slowing down the ball and reducing the length of our strikes. The ensuing rucks then favoured the physically bigger Fingallians. In spite of the difficult conditions, all three of our teams kept on battling to the end and gave their all throughout. It is particularly encouraging that most players are now instinctively striking on either the right or left side depending on the position of the ball. For the blue team, Conall showed that he has been practicing his striking at home and delivered some terrific long clearances out to the wings. Millie had another excellent game and pulled on the moving ball quite brilliantly on a number of occasions. For the maroon team, Rian worked hard and showed great determination and tackling skills throughout. Aoife had a powerful game in defence, winning great ball and looking up to find a team mate before delivering long accurate passes. For the Amber team, Eoin made some excellent saves in goal to keep us in the game and followed these with long puc outs. Conor showed lovely skills and great promise in his first competitive outing with this team. The key message for our players this week is “get in tight to your opponent and you will never get hurt when tackling for the ball”.